Be the first to share your favorite memory, photo or story of Dora . This memorial page is dedicated for family, friends and future generations to celebrate the life of their loved one. 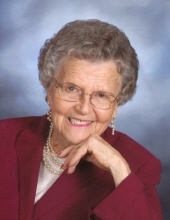 Dora Mae Joyner Britt, long time resident of the Dobbersville community, and most recently, Brookdale, Country Day Road, peacefully passed away on Thursday, February 7, 2019 with her family by her side. She was born on July 5, 1922 and preceded in death by her parents, Sam B. Joyner and Bettie Andrews Joyner. She was also preceded in death by her beloved husband of 71 years, Ralph J. Britt, infant son, Sammy Britt, grandson, Michael E. Britt, Jr., sisters, Pennie Baker, Gennie Britt, Vira Thornton, Billie Dove Best, and Marion Ruth Sutton; brothers, Claudie Best, Brazil Best, Bougy Best, Dallie Best, Floyd Best, Bonnie Best, Ulysses Best, and J.W. Best. She is survived by two sons, Michael E. Britt, Sr. and wife Jheys of Carolina Beach, Glen Britt and wife Debra of Mount Olive, and daughter, Betty Britt and husband Joel of Mount Olive; grandchildren, Olivia Lowry and husband Colin of Raleigh, Beecher Britt of Goldsboro, Kristen Bunn of Raleigh, Robert Britt and wife Lauran of Pikeville, Sam Britt and wife Ashley of Mount Olive, Jamie Britt Pittman and husband Reding of Pikeville, and Tyler Britt of Raleigh; great grandchildren, Jameson Lowry, Kyle Bunn, Dyllyn Bunn, Beckett Cruse, Ryker Britt, Cainen Britt, Calla Mae Britt, and Noah Pittman; sister Margaret Miller of Richmond, Virginia, and Chester Best of Mount Olive. She graduated from Grantham High School, married her sweetheart Ralph, and became a military wife, living in Monterey, California until they returned to Wayne County where they lived the remainder of their married lives. She retired from JC Penney department store in Goldsboro where she worked in the catalog department for 30 years. She was a devoted wife, mother, and grandmother. She enjoyed spending time with her family and had many lifelong friends. She was an excellent cook and was famous for her fried chicken. While residing at Brookdale, she enjoyed socializing with the many friends she made during her stay. She was a member of Eureka Christian Church. The Britt family would like to thank all who cared for Dora in her later years: Sarah Surles, Sherrie Garcia, Christian Caregivers, and the staff at Brookdale. Words are insufficient to express our gratitude for all they did for her. She loved you all like family. Visitation will be held from 6-8 pm on Saturday, February 9, 2019 at Seymour Funeral Home. The funeral will be held at 2 pm on Sunday, February 10, 2019 at Eureka Christian Church, Mount Olive with Reverend Frank Purvis and Reverend Debora Stilley officiating. Burial to follow at Wayne Memorial Park, Goldsboro. Memorials may be given in memory of Dora to the Carlisle Purvis Scholarship Fund in care of Eureka Christian Church, 2036 Dobbersville Road, Mount Olive, NC 28365. To send flowers or a remembrance gift to the family of Dora Mae Britt, please visit our Tribute Store. "Email Address" would like to share the life celebration of Dora Mae Britt. Click on the "link" to go to share a favorite memory or leave a condolence message for the family.